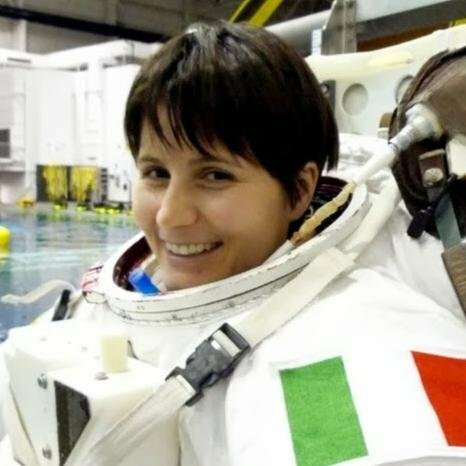 The departure and return to Earth of ISS astronaut Samantha Cristoforetti IZ0UDF will be broadcast on NASA TV during June 11, 2015. 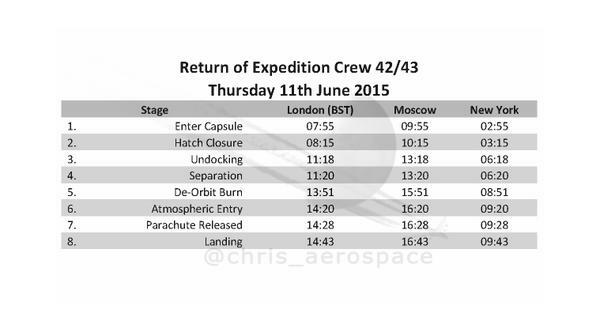 With her on the return journey will be Terry Virts and Anton Shkaplerov. The three have spent more than six months performing scientific research and technology demonstrations in space. Cristoforetti lifted off from Baikonur in Kazakhstan on November 23, 2014, arriving at the ISS the following day. On December 15, 2014 she conducted her first Amateur Radio on the International Space Station (ARISS) school contact on 145.800 MHz FM using the amateur radio station in the Columbus module. In the following months Cristoforetti went on to carry out more ARISS school contacts and was involved in the Blank Test Transmissions from the new ISS HAMTV digital television system on 2395 MHz which were received by radio amateurs around the world. Cristoforetti holds the record for longest uninterrupted spaceflight for a European Space Agency (ESA) astronaut and on June 6 at 11504 GMT set the record for the longest single space mission by a female, surpassing the 194 days, 18 hours and 2 minutes logged by NASA astronaut Sunita “Suni” Williams KD5PLB (Space Station Commander 2012) during her mission to the International Space Station in 2007. U.S. astronaut Peggy Whitson KC5ZTD (Space Station Commander 2007) holds the cumulative female record for the most time spent in space on multiple flights with 376 days and she is now training to launch on her third flight in March 2016. NASA says coverage of the return begins at 10:40 a.m. EDT Wednesday, June 10, when Expedition 43 Commander Terry Virts of NASA hands over command of the space station to cosmonaut Gennady Padalka of the Russian Federal Space Agency (Roscosmos). At 6:20 a.m. the following day, Virts and Flight Engineers Samantha Cristoforetti of ESA (European Space Agency) and Anton Shkaplerov of Roscosmos will undock their Soyuz spacecraft from the space station and land in Kazakhstan at 9:43 a.m. (7:43 p.m. Kazakh time). Their return wraps up 199 days in space, during which they traveled more than 84 million miles since their launch from the Baikonur Cosmodrome in Kazakhstan on Nov. 24. Their return date was delayed four weeks to allow Roscosmos to investigate the cause of the loss of the unpiloted Progress 59 cargo ship in late April. When the Virts, Shkaplerov and Cristoforetti land in Kazakhstan Thursday, Virts will have logged 212 days in space on two flights, the first of which was on space shuttle mission STS-130 in 2010. Shkaplerov will have spent 364 days in space on two flights, the first of which was on Expedition 29/30 in 2011. This was Cristoforetti’s first flight into space. Expedition 44 formally begins aboard the station, under the command of Padalka, when the Soyuz undocks. He and crewmates Scott Kelly of NASA and Mikhail Kornienko of Roscosmos will operate the station until the arrival of NASA astronaut Kjell Lindgren, Russian cosmonaut Oleg Kononenko and Kimiya Yui of the Japan Aerospace Exploration Agency, who are scheduled to launch from Kazakhstan in July. Kelly and Kornienko are spending one year in space, twice the typical mission duration, to provide researchers the opportunity to learn more about the medical, psychological and biomedical challenges faced by astronauts during long duration spaceflight.